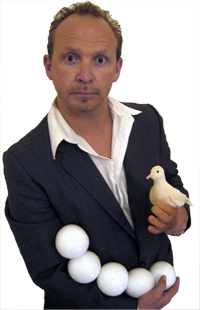 International award winning comedy circus performer Kim Potter presents a fresh comedy show filled with comic daring and circus genius. Also, Introducing the inept sophistocation of his alter ego, Mr Vinyl Caruthers. Live and direct from 1972 Las Vegas, Vinyl relives his golden days with a collection of stunning illusions he can't quite remember, set to the tune of classic seventies TV themes you tried to forget.